Remember this every time you pass that little penny in the car park. He said Angels drop them down. That an Angel’s dropped to you. Earlier this week I received this little poem on my mobile phone from a friend. Strangely enough I had also read it on Bereavement for Parents’ site just hours before… I thought back to a horrible day in my life when my Dad and I saw a coin lying in the street. My Dad bent down and picked it up. “This is from the angels. Always keep it – it will bring you good luck”. I dutifully put the coin in my purse and thought “how will I ever know which one is my lucky coin”…. Two days ago we were sitting in a restaurant in Cape Town when I saw a coin lying between chairs. I immediately thought of the poem I had read just days before and remembered my Dad’s words. I did not bother to pick up the coin. I have thought about the coin a couple of times and regretted not picking it up! Jon-Daniel and I went for a long walk on the beach today. We walked ankle-deep in the sea not talking at all. I was walking along all teary eyed. The thought crossed my mind that this was something Vic could never do – take long walks on the beach…. I was thinking how I wish she was here in Cape Town with us…. The waves rolled in caressing the sand and then slid back…The sand was so clean and perfectly “even” as the waves receded back into the sea. I looked at Jon-Daniel thinking how sad he was looking. I knew, he too, was thinking of Vic. 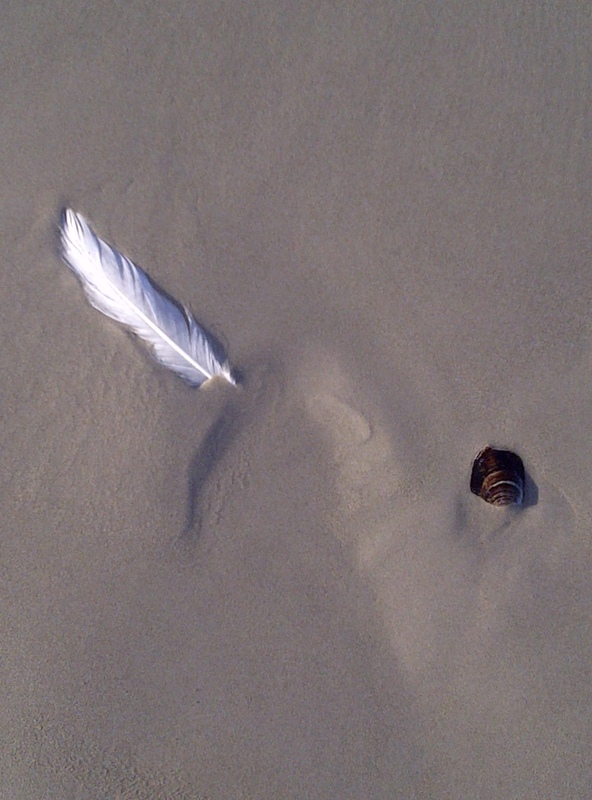 My eyes followed a wave rolling out when I saw this perfect white feather lying motionless in the sand where minutes earlier there was water…. I felt immense peace and joy. I knew that at that moment my precious child was walking next to me. I knew that she had seen my tears mingle with the salty sea water and that she wanted me to know that she was with me. How to Tell when Angels Are Around Us Jo Ann Schlicker, Yahoo! Contributor Network Sep 10, 2010 “Share your voice on Yahoo! websites. Angels appear to people of all religions and sometimes to people who do not believe in anything. The Bible and other holy books are full of examples of angelic messages and appearances. The word angel comes from the Greek word “angelos” from the word “ev-angelos” which means the gospel or good message. Angels carry messages from God to humans. In the Christian Bible, angels often spoke to people in a dream. One angel visited Joseph in a dream and told him of Mary’s baby conceived via the Holy Spirit and he should not put her aside as was the custom. An angel warned Joseph to take a different route home after the birth of Jesus because the wicked king wanted to kill the infant. Jacob dreamed of a ladder of angels leading to heaven. Many more examples showing divine messages from heaven exist in the Bible and the literature of many cultures and religions. Do angels send you messages in your dreams? Many people believe that angels bring “I love you” messages from heaven. Angels send calling cards and little gifts for those who are open and receptive to them. People often say they receive angelic gifts of comfort or warning against danger when they feel sick or discouraged. So, how do you tell that there are one or more angels around you? Here are some signs that many people recognize. Feathers show up in unusual places and when you least expect them. Angel feathers are white, fluffy, and seem to fall into your path for only you to find. Sometimes, they glow with colors and radiances you never see in birds. Most people find money from time to time. Some say that angels purposely toss coins into your path. The denomination of the coin and the message on it all hold clues to its meaning. One person may find pennies while others find dimes everywhere. Money signifies support in finances, emotions, spirit, and physical being. Rainbow promises sometimes show up from nowhere. After the great flood, God set a rainbow in the sky as a sign of His promise not to destroy the earth by water ever again. Double rainbows, and rainbows captured in dew or mist are especially significant. People sometimes think of butterflies as tiny living parts of rainbows that bring their own promise. They sometimes fly to relatives of a deceased loved one. Most people spend time gazing at cloud formations and seeing pictures there. Clouds forming unusual shapes such as hearts, feathers, or angelic forms, clouds that are colored or shaped like orbs show special significance and could be angelic messages. Did you ever catch yourself singing or humming the same tune repeatedly? Music repeats itself or comes in themes over time. Song titles may be messages offering guidance from an angel. Most people know when that happens and can discern the meaning for themselves. Although they will not admit it, most people have heard a voice calling their names. Sometimes in an attempt to get your attention, an angel needs to speak to you directly. Pay attention to that voice to see what message it may bring you. Have you ever seen a beam of light that you cannot explain? When a bright or colored light floods a room, it could be brilliance from an angel nearby. Sometimes, you can see these lights even with your eyes shut. A mother cradled her sick child and prayed for guidance. The little girl woke up unable to walk and her mother rocked her and crooned softly to her, and worried about the future. She heard a voice say, “Everything will be okay.” A soft glow filled the room for several minutes and the mother knew all would be well. The next day the child walked again. Whether the light came from God, or an angel, it definitely was heaven sent. Some people say they feel the brush of angel wings on their face or arms. Others feel angelic hands on their shoulders or on the top of their heads. A room may fill up with delicious scents of chocolate, roses, bread baking, or another loved aroma. You are so lucky!! I am doing a lot of reading on angles and heaven and hope to become more sensitive to the angels in my life. Have you blogged on it?? I have tried looking, but there is too much to plough through… I am so interested in hearing more!! Our grief is the same Gloria. I was so excited and happy to find the feather!! Vic LOVED dragonflies! Glad you too had a sign from heaven. Wow, Vic loved dragonflies, too! Special, Tersia. Love this! Bless you and the boys! Thank you Julie. I was so excited and happy! Tersia I enjoyed this post – and I do know that Angels visit and bring messages, comfort and reasurance that our loved one is looking over us. Little things, like your feather that could not get there by itself or survive against the energy of the sea – these things have special a meaning. I know, I too have experienced these coincidences that I like to refer to as visit from my Angel. Since I picked up the first feather I have found one EVERY day. I have not looked – they have just floated into my life. I now know that my precious child is with me all the time. I am so glad you too have had visits from your Angel! Oh, how beautiful. <3 Thank you for sharing this! Vic is walking with you…she knows you miss her…her positive energy is all around you! Next Next post: A message from Heaven!